Yesterday was the last day of the #plantpower challenge so today I wanted to celebrate with a #plantpower approved recipe. What exactly is this? #plantpower is Kasey and Heather‘s challenge run for a month where they encourage their blog readers to add more plants into their lives. Heather is a vegan but this challenge is not about going vegan for me. It has been an experiment in adding more plant based foods such as fruits, veggies, nuts, seeds, and beans into my diet. I am the worst about getting extra veggies in my diet so any excuse to add in more plant based foods and I’m sold. Here are two dinners, two different ways, and both plant based! A dinner full of veggies is just what I need. Precook your spaghetti squash before getting ready to assemble your dinner (it will take 45 minutes to an hour). To do this preheat your oven to 400 degrees. Slice the squash in half lengthwise and scoop out your sides. Bake the squash cut side down for 45 minutes to an hour until done. In a skillet over medium to low heat saute the olive oil and baby spinach until wilted. Meanwhile preheat your oven to 350 degrees. Add in the crushed tomatoes and paste letting simmer over low heat 1-2 minutes. Mix in the kidney beans and fresh basil, simmering 1 minute more. Lastly add in your spaghetti squash (scraped out with a fork) and toss with the sauce. Pour the spaghetti squash mixture into an 8X8 baking pan sprayed with olive oil. In a skillet over medium to low heat saute the tsp. of olive oil, zucchini, and bell pepper until cooked. Add in the diced cherry tomatoes and shred the carrot over the veggie mixture continuing to cook. Mix in the cooked black beans and spices while cooking to saute over low heat. Lastly toss in the cooked spaghetti squash. Pour your mixture in a greased 8X8 square or round baking pan. What’s your favorite way to up your plant intake??? 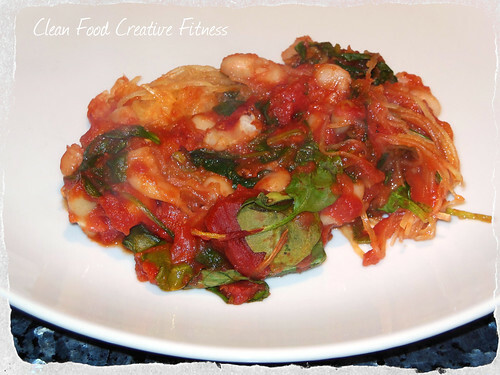 This entry was posted in Recipes and tagged gluten free, Italian, low carb, spaghetti squash, Spicy Bake on March 1, 2013 by danielle. That looks so good and I love that you did 2 versions. Too bad Spahetti Squah season is over here! Aww! Maybe you’ll come across one of the last batches of squash! 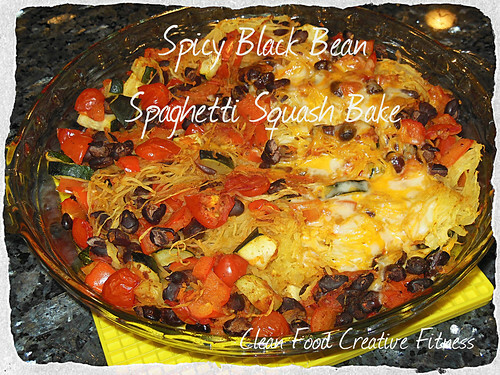 Yay–glad you like spaghetti squash bakes–it is a GREAT way to get in extra veggies. Love these two variations. After my experiment last week, I’m excited to make it again, but I think I’ll try your ideas to change it up. Ugh, LOVE your food! Looks divine! Yum!!! My favorite way to up my veggie intake is my roasting a whole bunch so I have them on hand or adding spinach to smoothies! Both of these versions look awesome! I up my plant intake by snacking on veggies and hummus. Both of these recipes look fantastic! You’ve had some awesome looking recipes lately. I’ll be looking them up this weekend for meal planning. Thanks Hannah! Didn’t even realize it was vegan! That’s great! 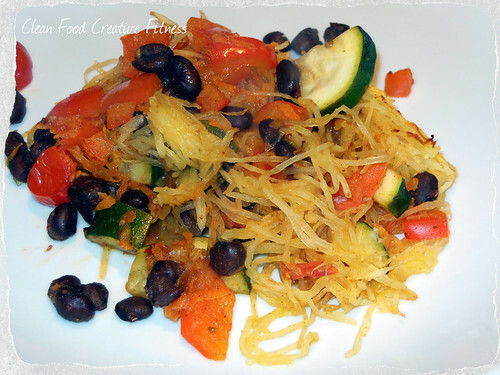 yumm I love spaghetti squash both of these recipes sound soo delicious! Mm, looks really good. I haven’t tried spaghetti squash yet, which is so devastating! We don’t get it that easily in the UK You better believe I’d stock up if I saw it in the supermarket though hehe. You definitely need to stock up if you find it! I love it! You rock for this!!! Since everyone is all about paleo, I’ve been missing out on all the delicious eats! This looks awesome. Plus I’m obsessed with all things squash. Obviously. I’m so excited for you to try it! You are going to love it! I want both of these right now!!! These both look delicious! I’m especially intrigued by the black bean version though- I’ve never tried mixing spaghetti squash with those sorts of flavors. Yum! The black bean one was my favorite! It was really great leftover too! I love it too! So great! 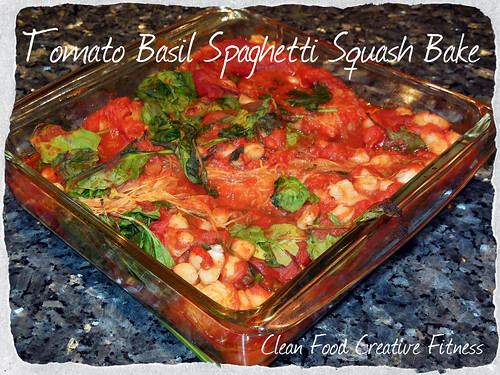 Great ideas to make spaghetti squash into a bake! I’d omit the beans, but other than that, it looks great! I love adding veggies to everything I can: my egg scramble, a smoothie, stir-fry. So glad you like it! You could definitely swap out the beans for chicken or ground turkey too! I can’t believe I’ve never tried spaghetti squash! You have to try it! It’s great! Both recipes sound and look delicious, Danielle! Spaghetti squash is my latest obsession, so I’m always excited to discover new ways to prepare it. I love the idea of adding a little Mexican flare with black beans and oregano! My favorite way to “sneak” in an extra serving of veggies (or three) is by sauteeing spinach with garlic and serving it as a side, or by adding it to a soup. Several cups of raw spinach wilt down to less than a 1/2 cup, which makes it really easy to get nutrients without adding a lot of volume. I also love that spinach takes on the flavor of whatever you cook it with–so versatile! I actually made the Spicy Black Bean one for dinner last night for my sister & I! Loved that it was vegan. It was so delicious & it felt so good to know that all i was eating was healthy vegetables! I’ve been wanting to try spaghetti squash for a while, but this was my first time actually using it & I loved it! So glad you liked it Ashley! Thanks so much for letting me know you enjoyed it! You will love it Jessie! These look great – I would definitely love to try the spicy black bean version! However, they aren’t actually paleo if you include the beans (legumes aren’t included in the paleo diet) But I love how you’ve squeezed in loads of veggies! My gosh I can’t believe I wrote they were Paleo! Must have been a slip of my mind! Thanks for the correction!